If you suffer with any of the above complaints, an hour’s testing could seriously change your life! 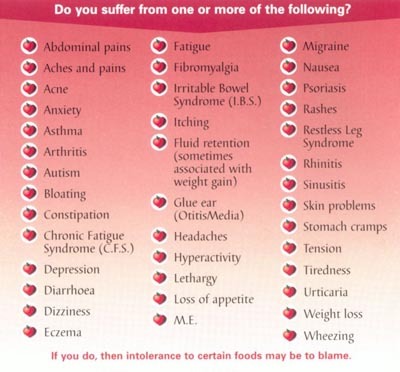 A survey of 6,000 people in the UK, carried out in May 2003 by Allergy UK, (A Medical Charity founded in 1991) showed 69.8% either had or had a close relative suffering from some kind of food intolerance or allergy. Also 50% had children of whom 39.2% also suffered from allergic complaints. Recent media and government research into the causes of obesity have shown that there has been a dramatic increase in the last 30 years in the consumption of junk food and refined foods. This is leading to thousands of people developing food sensitivities and intolerances. It has also been reported in the national press, that the NHS cannot cope with the level of allergy patients currently requiring treatment, that allergic conditions have increased 4 fold over the last 20 years and that there is currently a 2 year waiting list for NHS tests.